As if we haven't already gotten enough heat this summer, which has featured just one high temp in the 80s this month and weeks of consecutive above-normal temperatures that started early in the summer, we will likely actually get HOTTER in the coming week. The long-range global models are indicating a massive high pressure system at the surface and aloft will build over the southern plains and extend into the Mid-South this weekend into at least the first half of next week. The maps below show the ridge of high pressure as forecast by the GFS model at about 5,000 feet, 18,000 feet, and 39,000 feet on Monday evening, August 2. The GFS predicts our high Monday will easily soar over 100 degrees. Given that multiple models are forecasting a very strong high pressure system, I am somewhat confident in this actually occurring, though exactly how hot it will get is the big question. Recent rains will help the next few days, but by early next week, if no more rain falls, the ground will be drying out again, which will not help matter any. In addition, the surface high will be just to our west, which would mean light wind with a northerly component. This would mean that humidity levels could drop off in the afternoons under intense heating. That sounds like good news, except that drier air heats up more readily. If dewpoints fall into the 60s (drier air than we have had recently), the temperature will more easily climb above 100. We'll have to see how this all pans out, but if I were a betting man, I would argue that we'll be seeing our first triple digit heat of the summer sometime between Sunday and Wednesday, and there COULD be multiple days of 100+. Heat Advisories, and possibly Excessive Heat Warnings, will be posted as we get closer to the hottest days. Shelby County has already seen 8 heat-related deaths this summer. Plan now for the excessive heat - let's not see that number rise any further. A line of thunderstorms moved south to north through the Mid-South and Memphis area late last evening. The line, termed a mesoscale convective system (MCS), was trailed by light to moderate steady rain. It reached the TN/MS state line around 10pm and continued north, collapsing after 11pm into an area of rain. While Severe Thunderstorm Warnings were issued for the main line of storms as it moved through the metro area, the more interesting weather phenomena that occurred last night was the formation of a wake low. A High Wind Warning was issued around midnight for counties north of greater Memphis as a result of damaging wind of 40-60 mph that occurred from this phenomena. Numerous trees were downed across Lauderdale County. So what is a wake low? According to the AMS Glossary, it is "a surface low pressure area or meso-low (or the envelope of several low pressure areas) to the rear of a squall line; most commonly found in squall lines with trailing stratiform precipitation regions." This setup is what happened last night - as the squall line collapsed after passing through the metro area, downward moving air warmed and formed a small-scale (mesoscale) low pressure system, which, in combination with a small-scale high pressure system directly behind the squall line, created a pressure gradient that supported the development of high wind. Radar data clearly show the presence of this wake low with wind data (shown in the first loop below) depicting 40 mph+ wind over the affected area and precipitation data (second loop below) showing a lack of rainfall in the area. The descending air (subsidence) creates clearing conditions in the vicinity of the wake low, so a lack of rainfall is expected (as opposed to a severe thunderstorm which can create high wind due to descending air from the core of the thunderstorm). Click here for Doppler velocity (wind) data associated with the wake low. Brighter colors are higher wind speeds. Millington, TN is at the lower left corner of the image loop. Click here for reflectivity (precipitation) data associated with the wake low. Notice the lack of rain in the area with the highest wind speeds in the first loop. More information on wake lows can be found on Wikipedia. In addition, a damage survey from north Alabama in April 2009 also describes the formation of a wake low that brought damaging wind to the area. It's been another long, hot spell of summer weather in the Mid-South with a week gone by since the last significant widespread rains again. The weather pattern we can thank for that is the Bermuda High, which has been parked over the southeast U.S. for much of the summer, but has been particularly strong the past week. It has suppressed convective activity, yet brought enough moisture north from the Gulf of Mexico to keep it humid on top of being hot. Heat Advisories for heat index values of 105+ have been a daily occurrence. That changes some tomorrow as the remnants of a ragged Tropical Storm Bonnie begin to move north from the central Gulf Coast and to our west over the next couple of days. The high pressure will weaken enough that, combined with the remnant low, scattered thunderstorms will result. I expect that the most widespread activity will actually be Monday, however a chance of thunderstorms will exist Sunday as well as Tuesday and possibly Wednesday. The increased cloud cover will provide a little heat relief, especially Monday, before the Bermuda High re-builds and heat returns for the latter half of next week. For complete forecast details, check out the MWN Forecast for Greater Memphis. So far, it's been a relatively quiet start to the 2010 Atlantic tropical season (which had started with nearly unanimous predictions for a highly active season), with just one named storm (Alex) that went on to become a hurricane and a second Tropical Depression. Unfortunately, south Texas and northeast Mexico have been the recipients of both storms and massive flooding was the result. However, as demonstrated in the NOAA-provided graph below, it certainly isn't over yet! While the predictions may end up being a little on the high side, climatology indicates that the peak of the season is still ahead of us and that June and early July are typically fairly quiet, with the peak occurring in early September. The next potential system is currently a tropical wave near Puerto Rico, but beginning to show signs of becoming the next tropical storm. The Hurricane Center has upgraded its chance of becoming a tropical depression in the next 48 hours to 40% as of this writing. (UPDATE: At 1pm CDT Tuesday, the probability was raised to 60%.) There are factors working on both sides of further development and eventual strength. Pros: warm waters, low upper-level shear, and the current wet phase of the MJO (Madden-Julian Oscillation). Cons: dry, stable air aloft and potential land mass interaction. The eventual track is a little more certain as a cluster of computer models agree on the steering currents this week. 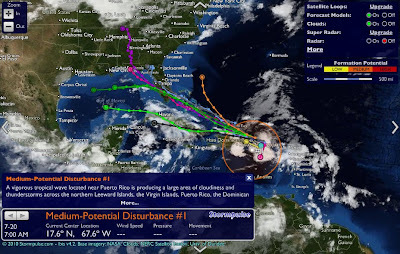 Those model tracks are shown below (courtesy StormPulse, click for larger image) and indicate that the Bahamas, south Florida, and then potentially the Gulf of Mexico are all in sight, should it develop further. The MWN Tropical page will have the latest on this developing storm, as well as all future storms this summer and fall. If things play out as expected, there's still a long season to come! * Heat index readings of 105 to 109 degrees will result from daytime temperatures in the mid to upper 90s and dew points in the mid 70s. Little relief can be expected Wednesday night with lows remaining in the middle to upper 70s. * The highest heat index readings will occur between 11 AM and 6 PM Wednesday and Thursday afternoons. * Heat index readings 105 degrees or greater can be dangerous if the proper precautions are not taken. Heat is the number one weather killer. Young children... elderly people... and those with illnesses or heart conditions are most at risk. possible. Drink plenty of fluids... stay in an air-conditioned room or at least open windows and allow air to circulate... stay out of the sun limiting outdoor activities to early in the morning or in the evening. Don't forget to check up on relatives and neighbors. My posts of late have been few and far-between. I pledge to do better! If you know me well, you know I like stats, so I figured I'd throw out some Memphis weather stats on heat and rain for you. Leading up to today, Memphis International Airport (the official recording site for the city) has recorded high temperatures that met or exceeded the "normal" (though I prefer the term average) high temperature for 53 consecutive days, dating back to May 21. Thanks to periods of thunderstorms yesterday and today, Memphis only managed to eek out a high of 90 today, two degrees short of the normal high - the first "below normal" high temperature since May! That streak ends. The "break" in the heat (though not humidity) today was thanks to a series of thunderstorm complexes that began late Sunday evening and continued through this morning, with no less than a half dozen complexes affecting some portion of the Mid-South. Rainfall totals in the metro area have been impressive, following near record-setting dry conditions over the previous 6 weeks or so. While Memphis Int'l picked up only 0.31" of rain for the month of June, 5.56" of rain fell since midnight Sunday night (Monday morning), including a record 4.56" on Monday. At the National Weather Service office at Agricenter International in Cordova, 5.44" of rain fell in the same period. And at MemphisWeather.net's headquarters in north Bartlett, 5.08" of rain fell. It's been quite the 36 hour period with flooding of roads and underpasses, creeks over their banks, a couple of water rescues, treacherous rush hours, and amazing cloudscapes. Looking ahead, unfortunately the 90-degree streak will not end anytime soon. In fact, Heat Advisories are once again posted for Wednesday and Thursday as strong high pressure builds back over the Mid-South in the upper levels of the atmosphere, capping off any thunderstorm development, and bringing more dangerously hot conditions. High temperatures will climb into the mid to upper 90s into the weekend. With recent rains, low-level moisture will also be high and heat index values will climb well above 100 - perhaps to 110 on Thursday - through the rest of the week. The upper level high will weaken slightly this weekend, which could allow a few more clouds and a low chance of afternoon thunderstorms, but early indications are it could build back in early next week, bringing more heat. Stay hydrated, stay out of the heat if possible, and check on those most susceptible frequently. Light-colored, loose fitting clothing is best and drink even if you are not thirsty. We've already had two heat-related deaths this year, we don't need more. Thanks to a very persistent summery high pressure regime and a lack of significant frontal systems, the Mid-South saw one of it's warmest Junes on record. In fact, by the end of the month, Memphis Int'l Airport had seen 41 consecutive days of high temperatures at or above average (every day in June) and Memphians also sweated through a 17-day streak from the 12th through the 28th with high temps at or above 94 degrees. For the month, the average temperature was 84.6 degrees, which was 5.9 degrees above normal and tied for the second warmest June on record (behind 1953 and tied with 1952). The average high temperature was 93.6 degrees with only four days under 90, all in the first week of the month. The maximum temperature for the month was 98 degrees on the 21st and 22nd and the lowest was 68 on the 7th. A record warm minimum temperature was set on the 19th, when the low dropped to only 80 degrees. In addition, the wet pattern the Mid-South experienced in April and especially May came to a screeching halt in June for most locations. Though there were scattered thunderstorms during parts of the month, with some areas of Shelby County like Collierville and Germantown seeing localized flooding from slow-moving airmass thunderstorms, the recording stations at Memphis International Airport, the NWS office, and WXLIVE! in Bartlett were very dry. There were only three days during the month in which measurable precipitation fell at the airport (five additional days saw a trace), which recorded a total of just 0.31" of precipitation for the month and went down as the 3rd driest June on record. The total rainfall after June 9th was a trace. Average precipitation for June is 4.30". The peak wind gust was 43 mph, also on the 9th. Click here for the NWS climate recap for June. Bartlett also saw a very hot and dry month. The average temperature for June at the WXLIVE! station in north Bartlett was 82.9 degrees with a maximum of 98.7 on the 25th and a minimum of 63.5 degrees on the 7th. The high temperature reached 94 or higher in Bartlett on 18 consecutive days (12th through 29th) and failed to reach 90 on only 4 days. After a record 15" of rain in May, June dried out quickly as WXLIVE! recorded only 2.19" of rain for the month, about half of a normal June. Over half of that total fell on the 3rd (1.29") in a thunderstorm. A co-located manual gauge used for the CoCoRaHS program measured 2.33" in June. There were six days with measurable precipitation, but only one in the last 20 days of June. The peak wind gust was 27 mph on the 9th. Click here for a daily statistical recap on MemphisWeather.net. 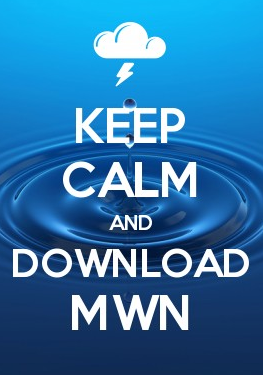 For the month of June, the average temperature error in all MWN temperature forecasts was 1.56 degrees, the best among all compared computer models and the National Weather Service (by 3%+). MWN's forecasts extend out five periods (or 2.5 days). Exactly 80% of the MWN temperature forecasts for the month were within 2 degrees of actual. For dewpoint accuracy, the MWN forecast was also the best of the data sources at 1.50 degrees average error, more than 0.20 degrees (14%) better than the next most accurate source. More detailed accuracy statistics can be found here.